Last Thursday, I headed to downtown St. Louis for Iron Fork 2013. 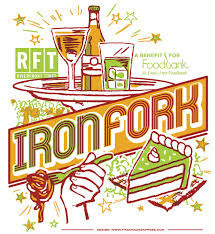 I talked a bit about it here, but in case you missed it, Iron Fork is a annual food event in support of the St. Louis Area Foodbank. The event takes place at Union Station in two giant ballrooms that are stuffed to the brim with area restaurants dishing up all sorts of samples. St. Louis resident or not, this post should appeal to you, because after navigating my way through Iron Fork, I'm here to tell you some of the tips I picked up on how to survive a food event. 1. Bring a friend (or two or three). My sister Renatta, my sister-in-law Katelyn, and our friend Emily all joined me at Iron Fork. They proved valuable for a number of reasons, including helping me squeeze (quite literally) into the tightest parking spot known to man, spotting the best-looking samples to try, and sharing bites of samples when I couldn't manage a full one. 2. Come HUNGRY. This one is a given. After all, it's a food event with 45 restaurants. However, I wasn't expecting the samples to be so large! Think "tapas sized" samples vs. "Costco sized" samples. 3. Browse before you buy. Granted, you aren't buying because all food samples were included in the ticket price. However, it's good to get an idea of what's all being offered rather than attempting to work your way around the room, stopping at each booth. You will run out of room, no matter how big your appetite! 4. Dessert first. We made the mistake of hitting up a few booths featuring savory dishes and by the time we were ready for ice cream (Serendipity--one of my all-time faves! ), they had completely run out. Luckily my sweet tooth was satisfied by cupcakes from The Cup, a place I'm now wishing I'd tried a long time ago (YUM!). 5. Ditch the bread. Don't miss the BBQ from Pappy's or the sliders from The Shaved Duck, but don't waste stomach size on buns or slices of bread. There are too many other good things to try! 6. Bring a water bottle (if allowed). We had drink tickets and they were selling waters for $1, but the lines at the bars were 3x as long as any of the food lines. We tried waiting in a few lines but they were so disorganized that we abandoned that effort, gifted our drink tickets, and made a stop at Sonic on the way home for much needed hydration! 7. Leave your personal space issues at the door. Iron Fork is a hugely popular event (one of the largest, if not the largest, food event in town) and they sell out every year! As large as the two ballrooms were, that's a lot of people (not to mention food!) to pack in. Realize it, be polite, and try to make friends with those you're rubbing elbows with! 8. Use public transportation, if possible. We learned our lesson the hard way. In addition to Iron Fork, the Blues had a game downtown which made for some mad traffic and minimal parking available. We would've been much better off taking the metro! 9. Don't feel like you have to finish your plate. Like I said in #2, the samples were large. If you don't love what you're eating, don't finish it. I'm not normally a proponent of wasting food, but in this occasion it's better to save room for that which you really want! 10. Take advantage of your must-try restaurants. Harvest, a popular STL restaurant, was there...but I skipped there sample since I've been there, done that and instead made sure to try new-to-me places like Seoul Taco, a food truck that I will definitely be hunting down again ASAP! All in all, Iron Fork was a great event. I came hungry, left stuffed, and had the chance to sample dishes from some of my favorite St. Louis restaurants as well as many on my must-try list! It's crowded and expensive ($35 for general admission, but this includes 3 drinks on top of all you can eat samples--and you can often find promo codes for $10 off), but the money is for a great cause and it's a fun way to enjoy the St. Louis culinary scene! Special thanks to RFT for hooking me up with 2 tickets to Iron Fork. All thoughts and opinions are my own.